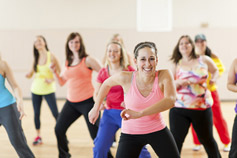 Low-impact aerobics is an exercise during which you always have one foot on the floor. This minimizes the landing force of your feet on the floor, unlike high-impact aerobics, which commonly involve vigorous jumping, shuffling and bouncing motions. Low-impact aerobics is done to music, and in addition to your lower body, you often use your upper body to help raise your heart rate. Low impact shouldn’t be confused with low intensity because low-impact activity can still significantly raise your heart rate to the point where it benefits your cardiovascular and respiratory system.